I went to PickNik again! I remember telling Michael Imran, the founder of PickNik, that I wanted to try his desserts. Been a while since I last went to PickNik so I went there again recently to try their 'pencuci mulut'. 1. Salted Caramel Brownie. Are you a fan of brownies? I know I am. This is an awesome choice. Brownie was sweet, went well with the salted caramel, and not forgetting the vanilla ice-creams. So three different layers of sweetness. 2. Pandan Creme Brulee. Something local for a change. I do not really know how to review creme brulee but I do know it's well-done when it's fun to crack the caramelized layer. 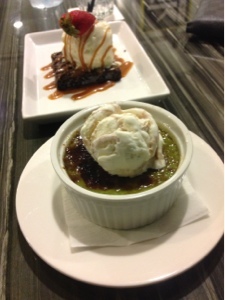 My friend Isaac's review of the Pandan Creme Brûlée: "It's simply divine!"